During my leisurely dinner at Crown Grill on the Regal Princess, diners toasted two birthdays and an anniversary. That might tell you that the ship’s specialty restaurant is a place for celebrations. I had no special date in mind when I paid $29 to dine in the Crown Grill. I had just heard that the dining spot was popular with passengers and wanted to see for myself. First, of course, is the great food and the friendly servers. I was quite pleased with both. Before ordering, diners are shown the various cuts of meat that they can order. 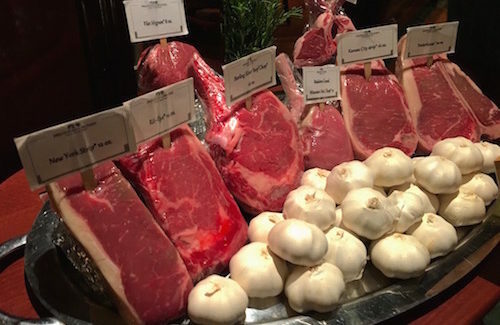 Crown Grill is famed for its steaks but it also offers lobster tail, veal chops, prawns, lamb chops and Chilean Sea Bass. Seated at the table next to me, Karen of Michigan had never had Chilean Sea Bass so she decided to try it. When it arrived, Karen took a few bites and it was obvious that she didn’t care for the fish. An attentive server noticed that Karen was eating around her entrée and asked if she would prefer something else. Karen ordered filet mignon. It arrived quickly and she happily ate every bite. I doubt that many restaurants would change an order like that – without an extra cost. I later talked with another diner who had enjoyed the sea bass at Crown Grill and he said it was excellent. It just didn’t suit Karen’s tastes. In her words, she had never tried it and now that she had, she would never order it again. Located on Deck 7 aft, Crown Grill is next to the Wheelhouse Bar, a British pub-style venue – separated only by a simple wood-and-glass partition. That means we got to hear the wonderful live music from the Wheelhouse while we ate in Crown Grill. On my dining evening, the pianist was playing legendary Big Band tunes such as those sung by Frank Sinatra. The music added to the wonderful ambiance of our meal. 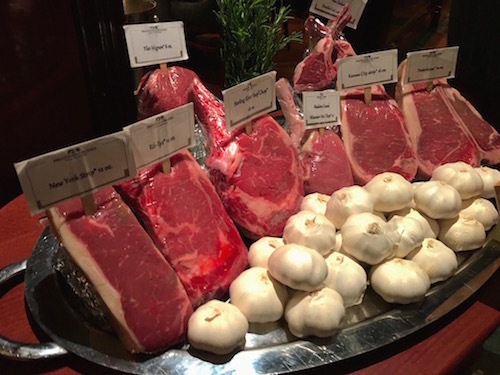 Crown Grill has a rich wood décor and a theater-style kitchen where you can see chefs cooking to order the top-quality cuts of meat and seafood. Crown Grill is only open for dinner from 5:30 to 10 p.m. Reservations are necessary and it is best to reserve early. Crown Grill also features three different gourmet salts for diners to try. I enjoyed all three. That might seem strange but each of the salts added a different flavor to my food. The server would put a bit of each salt or all salts on the edge of a plate so we could add them to our food ourselves. The Smoked Applewood Salt from the Yakima Valley of Washington state is fired with sweet apple wood which flavors the smoked seat salt with a subtle fruit wood taste. The Himalayan Mountain Pink Salt is robust with a mineral flavor. Along with being tasty, the salt also is said to provide many health benefits and to remove toxins from the body. The Hawaiian Black Salt is a solar-evaporated Pacific sea salt combined with activated charcoal. It has a stunning black color, silky texture and natural saline flavor. The menu is quite long with difficult choices. For appetizer, I had the hand-cut beef filet tartare seared on a plancha-type griddle. It was served with a smoky dressing, crispy polenta sticks and a fried quail egg on top. I’m going to have to look for quail eggs at home because that one was very flavorful. Next I had the black and blue onion soup which is made with a dash of Jack Daniel’s whiskey. The soup had a great Roquefort cheese crust. For entrée, I went with the ribeye steak, 14 ounces cooked to perfection. Other steak choices were a 12-ounce New York strip, 22-ounce porterhouse, 16-ounce Kansas City strip and 8-ounce filet mignon. Side dishes were baked Idaho potato, garlic and herb French fries, red skin mashed potatoes, grilled asparagus, creamed spinach or sautéed wild mushrooms. I was going to skip dessert but the server said I needed to sample the Crown Dependence Dessert. It is the executive pastry chef’s sampling of his featured desserts on the menu. When the dessert arrived, it was a beautiful presentation of the four desserts of the night. I would suggest any diner order it. Each of the four desserts was small but excellent. I couldn’t have picked a favorite. The Molten Dutch Chocolate Fudge Obsession was rich and warm with a soft center and double chocolate ice cream. The Lemon Meringue Pudding Tart had macadamia nut shortbread with a white chocolate French cookie. The Seven Layer S’mores Stack featured graham crackers, marshmallows and milk chocolate. The Milk Chocolate Peanut Butter Bar was one of the special Norman Love desserts served on the Regal Princess. The server was right. I would have been sorry if I didn’t get to taste those desserts and take a photo of them. The perfect way to end a meal.